For most professionals, LinkedIn is known as the social network where they post their resumes, look for jobs, hire new employees and make real business connections. While having a complete and compelling profile is an absolute must for any real estate professional wanting to boost their online presence, LinkedIn can be used for much more. In this blog post, we’re going to focus on a LinkedIn tool we at FreeAgent Blog by AdWerx have found to be very effective for content marketing, networking, prospecting and establishing thought leadership: LinkedIn Groups. Why are LinkedIn Groups Important? Last month, LinkedIn unveiled a new group design, accompanied by an infographic displaying the massive reach of its Groups. According to the stats, LinkedIn users are a part of over 2 million groups, with more than 8,000 groups created every week! 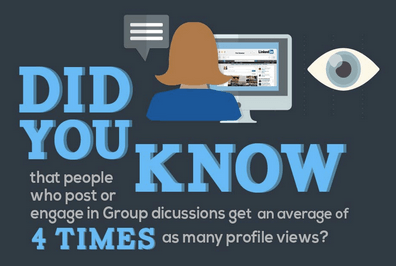 What’s more, people who post or engage in Group discussions get an average of four times as many profile views. Find out where your clients and industry experts hang out, join groups where they are present and make yourself useful to them. Join as many relevant groups as you can. The limit is 50, but it’s unlikely that you’ll reach that many groups as long as you are only joining ones that are relevant. Aim to engage with your five most relevant and active real estate groups. Ask thoughtful questions that will stimulate conversation and answer questions that show off your expertise. Pro Tip: Before joining any group, make sure to read and understand the group’s rules, on the top right corner of the page. Breaking the guidelines can 1) come off as spam to those people you are trying to build relationships with and 2) result in your termination from the group. As with all of your content marketing, be sure that you always offer interesting and relevant content for your audience. Do not promote only your blog posts and listings. Instead, be sure to also share market updates, current industry news and blog posts from other influential professionals in the real estate industry. Right now you might be thinking, “This sounds like it will take way too much time! No real estate professional has time for all of this!” The good news is, it’s easy to get familiar with the platform, and if you are intentional about managing your time it shouldn’t be too demanding. In the end, your efforts will pay off through the networking, marketing and other benefits that come from utilizing LinkedIn. Brian Geick, social media specialist ah HSA Home Warranty, suggests that if you set aside only 20 minutes twice per week to focus to maintain an active presence and nurture your connections, you’ll start seeing results. Click to enlarge. 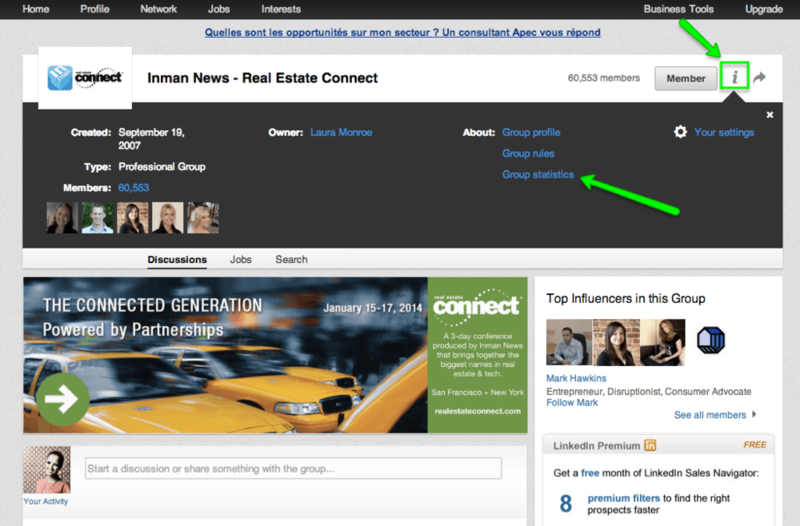 How to find LinkedIn Group statistics. Under “Activity,” look for the “Discussions Last Week” stat. You will want to join groups where the discussion ratio is high, because it means that there is more interaction between group members. 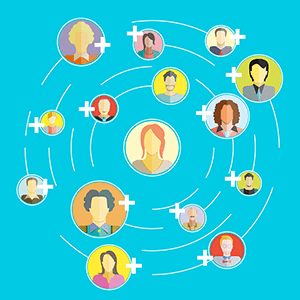 Consequently, you’ll likely generate more leads through active involvement. Research existing real estate groups, and figure out how you can create something different. One way to do this is to create a group focused on a niche market. For example, if you’re a luxury home real estate broker in Orange County, strive to build the very best group for the O.C. luxury homes real estate industry. Pro Tip: Optimize your group — use keywords in the title and description, because these will show up in LinkedIn group searches as well as on Google searches (huge!). It’s important to remember that LinkedIn is primarily for networking, which is distinctly different from advertising. Understand that LinkedIn alone will not likely generate any business. However, if a client or an industry expert were using LinkedIn to find a real estate agent, they would likely “be looking to see what kinds of groups and organizations the agent belongs to so they could get a better feel for who they are as a person,” said expert Teresa Boardman in this Inman article. LinkedIn is an important piece of your digital marketing and branding. Using the platform to its full potential will help demonstrate your excellence and dedication to professionalism as a real estate agent and real estate marketer. Inman News – Real Estate Connect – The purpose of this group is to promote greater networking within the Real Estate industry and is facilitated by Inman News, the industry’s leading source of real estate information. Real Estate Professionals and Vendor Network – The Real Estate Professionals and Vendor Network is comprised of those professionals who work in and serve the real estate industry. The Real Estate Networking Group – This group is a global networking group for those in commercial or residential real estate who are interested in discussing acquisitions, distressed notes, REO, construction, design, green development, asset management, architecture, jobs, mortgage brokerage, finance/banking, workouts, mezzanine, syndications, fund management, law and more. REAL Trends – REAL Trends shares data analysis and information on the residential real estate industry. Group members discuss ways to grow their businesses and understand their markets and customers more deeply. Luxury Real Estate Network – This group is for agents involved or interested in Luxury Real Estate. What about you? What benefits has your real estate business gained from LinkedIn?